As all otolaryngologists are aware, the upper aero-digestive tract directly interfaces with the external environment and is, therefore, vulnerable to bacterial infection. With the increased understanding of infection and microbiology in the nineteenth and twentieth centuries, followed by the advent of antibiotics, it was hoped that otitis media due to bacterial infection would become relegated to the annals of medical history - yet instead, this pathology remains one of the most common causes for otolaryngology and pediatric office visits today. Advances in medicine tend to occur as individual discoveries that propel understanding forward - the recognition of the biofilm may turn out to be one of those seminal events. During my training, I was taught that half of all otitis media with effusion were sterile, based on the fact that the effusions were culture-negative for planktonic bacteria. What has become apparent, thanks to scanning electron microscopy, confocal laser scanning microscopy and the PCR detection of bacterial mRNA, is that bacteria can exist in another form. In fact, as stated by one of the authors of this book - the ‘majority of bacteria in nature exist in the biofilm state’. It is becoming increasingly clear that chronic and/or recurrent infections may be clinically tied to the presence of biofilms. 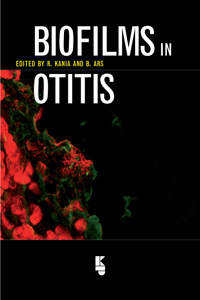 Professor Romain Kania and his co-authors, experts in their fields, have written a textbook that comprehensively describes biofilms and their likely role in otitis media. A biofilm is a complex multidimensional biologic fortress that protects bacteria against changes in the environment and hosts immune responses and antibiotics. The core of the biofilm is an oxygen depleted site, inhospitable to host defenses, and populated with bacteria that have adapted to their environment by slowing their metabolism. The biofilm is a reservoir of bacteria and extracellular matrix that irreversibly binds to a biologic site, such as mucosa of the nasopharynx adenoids, Eustachian tube, middle ear or mastoid, or a non-biologic site, such as pressure equalizing tubes, ossiculoplasty prostheses, cochlear implants or titanium mesh. When bound to a biologic site, the biofilm may lead to physiologic dysfunction and infection of the local tissue. While evidence accumulates, a causal relationship between biofilms and clinical chronic or recurrent infection has yet to be defined. Should future research bear this relationship out, how can the bacteria of biofilms be effectively treated, since the routine administration of antibiotics is ineffective? Potential options could include the use of other developing technology, including nanotechnology. I am confident that the reader will find this text by Professor Romain Kania and his co-authors to be stimulating, relevant and well written. I congratulate them for their important efforts in sharing their understanding of biofilms which may play a role in the development of age old infections that vex us to this day. 7. Is biofilm involved in the pathogenesis of cholesteatoma?